Planned look: The Empyrean project in Bangalore is being developed by a special purpose vehicle called FIRE Luxur Developers Pvt. Ltd.
Bangalore: After investing in four mid-income and low-cost housing projects in the past one year, Indiareit Fund Advisors Pvt. Ltd, promoted by the Ajay Piramal group, wants to refocus its strategy on projects with potential for higher returns. Indiareit will now look at deploying most of its new Rs500 crore domestic fund announced in October in redevelopment and defunct textile mills projects. “There are some 25 mills coming up for development and we want to either bid independently or through a special purpose vehicle," managing director and chief executive Ramesh Jogani said. “Redevelopment projects, particularly in Mumbai, also have great potential from an investment perspective," Jogani added. Indiareit’s revised strategy echoes the sentiments of many private equity (PE) funds with a focus on real estate in India. Funds that had zeroed in on the emerging, affordable housing segment as a demand driver during the economic slowdown believe that with the sector reviving, they should look at other growth areas. Among such funds are Kotak Realty Fund and Saffron Advisors, which have lined up about $400 million (Rs1,880 crore) and $140 million, respectively, for investments. Saffron Advisors’ founder and managing director Ajoy Veer Kapoor said his company will seek value in two sectors—warehousing chains and niche, city-centric developments in Mumbai or New Delhi. “We are not really looking at low-cost real estate projects because it’s still at a very new stage in India and not many developers have the bandwidth to pull it off," said Kapoor. The affordable housing story is a recycled version of the integrated township story in India, which never really took off, said V. Hari Krishna, chief investment officer at Kotak Realty Fund. The fund last October picked up a 50% holding in an affordable housing project of Janapriya Engineers Syndicate Ltd, a Hyderabad-based builder. “Such projects are mostly large, and so by the time you recover your money, it takes a long time," he said. A 50-60-acre affordable housing project would typically be sold and developed in phases and take about five-six years to complete. In the past 8-10 months, PE firms had reacted to what was then the need of the hour—financing developers to complete projects and funding projects that would sell quickly. Developers have since raised funds from other channels and the liquidity crunch has turned less severe. In 2009, till October, realty funds invested in 20 projects worth $867 million in special purpose vehicles and property companies, according to Venture Intelligence, which tracks PE and venture capital deals in India. More than half of these were in mid-income and affordable housing projects. Two investment bankers, who advise real estate clients on raising capital, said that with fresh capital flows into new real estate projects still being tight, developers depend on PE funds to raise equity for their ventures. Funds are looking at investing in short-term, small-format projects that will not take more than three-four years to finish, said Vinod Menon, head (real estate, investment banking) at o3 Capital Advisors Pvt. Ltd, adding that investors are also keen on offering last-mile funding. “Unlike execution capital, this is to fund the last leg of a project where the final interiors, etc., need to be finished," he said. Upbeat about the rebound in the sector, PE fund Red Fort Capital Advisors Pvt. Ltd says it is ready to put its money in greenfield projects right from the land acquisition stage, on account of lower land valuations now. Red Fort, which wants to invest Rs1,000 crore in the coming year, has in the past two months invested Rs150 crore in an office development project along with a developer. First Indian Real Estate (FIRE) Capital Fund Ltd, with a target investment of $100 million by end-2010, wants to partner small developers or entrepreneurs with no real estate background for large housing projects. Developers who have raised money from realty funds recently are hopeful of seeking their investments again. Mumbai-based firm Orbit Corp. Ltd, which raised about Rs175 crore from a PE fund for its 100-acre gated community project in Mandwa, a beach location close to Mumbai, is now in talks with two-three funds for large-format projects in the Mumbai metropolitan region, said Pujit Aggarwal, Orbit’s managing director. “Most developers need money now for investing in fresh projects or who want a cashout from a current project to get into a newer one. We want to raise funds for a few mid-income and low-end housing projects and are positive about the response," said Nayan Bheda, managing director of Neptune Developers Pvt. 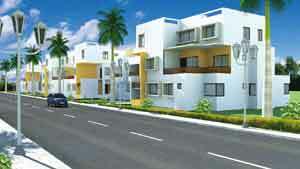 Ltd, which got funding from Indiareit Fund for a low-cost housing project in Mumbai last November.